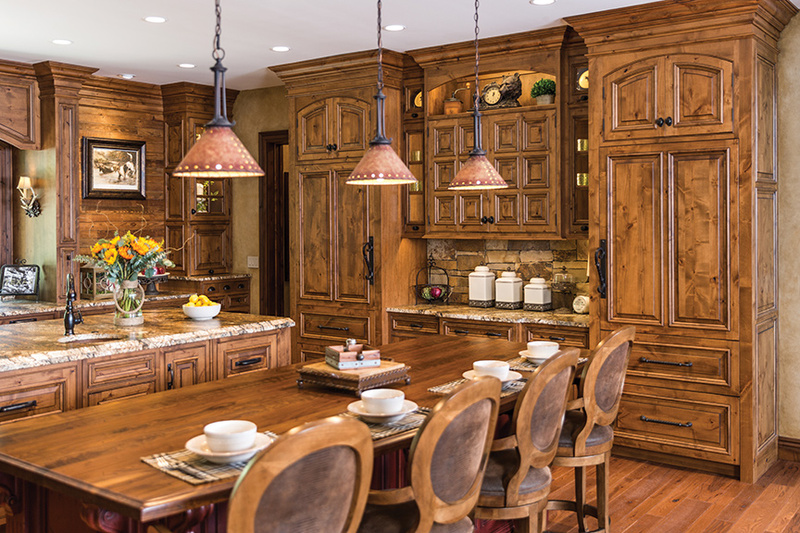 Reminiscent of Aspen, CO, the rustic lodge kitchen was designed to be the center of the home. Designed by Anne Marie Design Studio, the kitchen is open to the oversized dining room, great room and overlooks a breathtaking view of the lake. The kitchen needed to be able to accommodate large company parties, family gatherings and simple family meals with the couple and their grown children. Custom Amish cabinets were used, and lots of door samples were made until they found just the right one for the space. The flooring is a rustic knotty alder to match the other wood in the home. The walls on the left and right of the sink window are finished with reclaimed barn wood from the homeowners’ own barn on the property. The biggest challenge in designing the space was accommodating and hiding all the appliances. There are two islands. The red seating island houses a warming drawer, microwave drawers and steam oven. The prep island holds a copper prep sink with garbage disposal and trash can, Sub-Zero built-in icemaker and two sets of Sub-Zero refrigerator drawers. The range wall is detailed with stacked stone instead of a backsplash tile and supports a massive, smooth custom stone hood. Every single cabinet was designed with a uniquely blended detail so this kitchen is unlike any other you will ever see. You definitely don’t feel like you are in Missouri with this kitchen. We love how they brought in their own barn wood to accent the back wall. The amazing quality of the Amish cabinetry really shines.